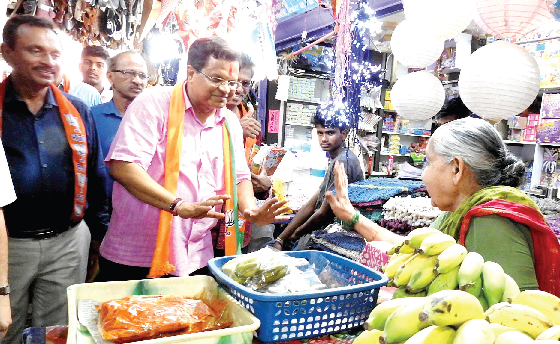 As South Goa BJP candidate Narendra Sawaikar descended on the commercial capital’s New Market seeking support from the market traders for his candidature, the sitting MP made it clear that the Dhavalikar factor will not affect his electoral prospects when people of the constituency are looking forward to the return of Prime Minister Narendra Modi in office. “I do not think that the Dhavalikar factor will impact my electoral prospects for the simple reason that people know they are voting in a national election and are looking forward to Prime Minister Narendra Modi continuing in office for a second term,” Sawaikar said, when the media asked him whether the decision by the Dhavalikar brothers and the MGP to extend support to the Congress party in the ensuing Lok Sabha election. Sawaikar’s statement assumes significance as it comes against the backdrop of the decision taken by the MGP Central Committee to extend support to the Congress candidates in the ensuing election, with the MGP exuding confidence that its decision will dent the prospects of the BJP South Goa candidate in Assembly segments such as Madkai, Sanvordem and Sanguem. Meanwhile, Sawaikar along with party’s dedicated band of supporters went round the New Market in the commercial capital to drum up support for his candidature. After seeking blessings from Lord Damodar at the Pimpalkatta, Sawaikar entered the market along with party leaders, including Rajendra Ajgaonkar, Sharmad Raiturcar, Rupesh Mahatme, Subodh Govekar, councillor Jaffar Budhani, Chandan Nayak and others. The sitting MP sought blessings and support of the vendors and traders as he went round the congested market. It’s a long custom and tradition for candidates contesting the LS and Assembly election s to visit the New Market seeking support and blessings of the traders as well as the customers for their candidature.